Hey Phil. Nice show with a touch of controversy. I’ve been a strong advocate for fish farms for a very long time. I think humans need to renew any “food” they consume based on our numbers and ability to overwhelm any environment – including over-fishing. You want to eat elk? Go ahead – but make sure enough are being raised to replace the one you killed. Apply that reasoning to any animal, bird or fish. So regarding your question on “fake fish”, I would eat it. I already eat mock lobster and immitation lobster. I don’t care for it much, but if it’s in a sauce or just added for flavor – who cares? I eat the salmon from Costco that they dye pink to make it look natural. Regarding the burger wars – I gotta go with the In-n-Out double-double with grilled onions as the best on the planet. Nothing around here rocks my boat yet, but I’ll let you know if I find something. That vegetarian clip made me laugh out loud. Great show again! I would eat anything that wasn’t harmful to my body in the long run. So if that includes a “fake” fish no problem. The question I have is are these fish being pumped full of steroids. If that is true, then nevermind. Otherwise, I’m with the first poster and couldn’t agree more with him. It helps save the environment and keeps food on our tables. The DoubleDouble is perhaps the best fast food hamburger I have ever eaten. I was in San Diego on business a few years ago and a colleague told me there are some items they do sell that are not on the menu but I can’t remember what they were. I don’t think it’s things like chicken wings and nuggets though, so what you said was true. Gotta try that recipe for the pressed burger. Those pictures look great. I do like Bobby Flay. He makes great food. Ever eat at Mesa Grill? Rick – I too have tried the imitation crab/lobster at many points, including in California rolls, and I can tell you I can’t stand it. If I can’t get the real thing, I’m not interested. I know our waters are overfished, and I knew sooner or later this would happen. It’s a sad thing indeed. There is no other like the Double-Double, I will agree. I’ll check out the Penn & Teller clip, Sick. Thanks for the tip. To touch on Leitch’s comment, I don’t know if these farm raised fish are being pumped full of chemicals. If they are, then it’s certainly something to steer clear of. I know that they’re doing a lot of DNA splitting to achieve these flavors, so I’m not sure if chemicals play a role or not. Great question. Hey Mile High, thanks for commenting again. There are many things available at In-n-Out that aren’t on the menu, but they’re nothing more than variations of what’s available. You can get “The Animal”, “The Flying Dutchman”, and many others. I found this web site that has a definitive guide to their secret menu on it. Luckily, no chicken McNuggets. And I have not been to Mesa Grill, but plan on doing so at some point. Have you been? How was it? Thanks again everyone. Happy Holidays! See you in ’08. Good show. They make me hungry every time. In and Out is one of my favorites!!!! Loved your show. I thought the bacon of the month club was a joke until I clicked that link. Fun! I was talking to my mother-in-law last night and she reminded me of my other favorite burger. You can only get this one on the East Side of Green Bay WI. The Krolls Double Cheeseburger. It’s on a hard roll served with ketchup and mustard, onions and maybe a pickle slice. It’s wrapped waxed paper and just dripping with butter. Throw salt on it and it’s a thing to die for – and a heart attack waiting to happen. But, if I only have once every year or so, I’m not going to miss it. Krolls also has great onion rings and chili. They opened a Krolls on the west-side by Lambaugh field, but it’s just not the same. We have several In-n-Outs in the San Diego area and it’s the best. Just like the Kroll burger (above) I’ll bet anyone anywhere is going to say theirs is the BEST! And they’re probably right. Thanks YB! I absolutely consider that perhaps the best compliment I’ve gotten – ever! Hey, Phil. Just got back from pedaling my loaded bike across the Panhandle of Oklahoma–thanks for keeping me company. 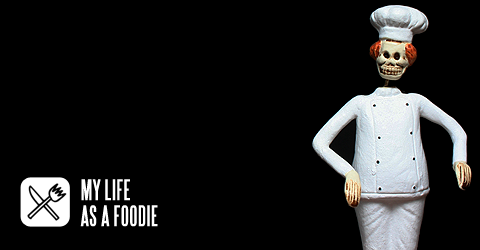 My Life As A Foodie is my favorite podcast–keep ’em rollin’. Jon, that was an excellent way to start my day this morning. Thank you for your kind words. You were on a bike tour across the panhandle – gotta love that! Glad I was with you on that ride. Thanks for listening!